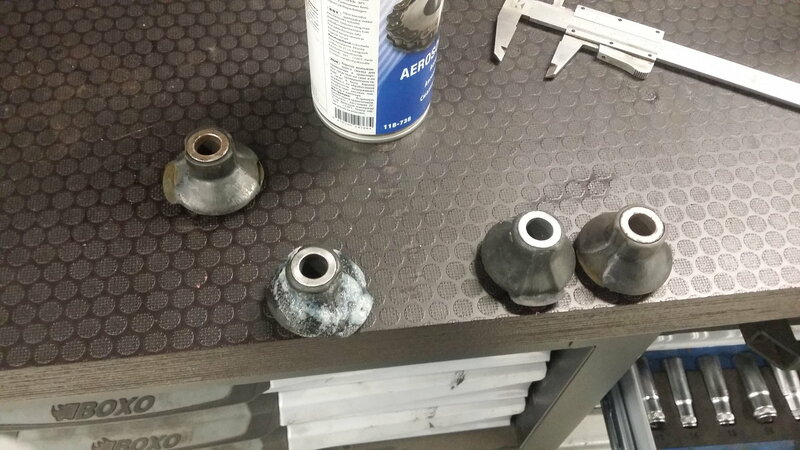 Replaced all front bushings, still hear slight clicking noise going over speed bump. dont mean to thrad jack but whats the best way to check the subframe bushings? Check your rear lower ball joints, and also the bushings/bolts that attach your rear subframe to the unibody. Good thinking Chris, Got any illustrations or tips on how to check if they are bad? I imagine they are. Support the car on jack stands by the unibody to take the load off the suspension. Then use a pry bar to check the components for play. I know a lot of guys will do it with no problems, but I don't like to pry on aluminum components directly. I'll put a block of wood or thick plastic (bondo spreaders work great) between the pry bar and the part as to not mar the surface. Did you lube the sway bar bushings yet? friday i put the car on the lift and did the 9-3/12-6 pulling on the wheel back and fourth as hard as i could and could not for the life of me feel,see, or hear any play. going to spray the sway bar bushings with the wurth oil, change steering rack bushings .,and rear shocks. 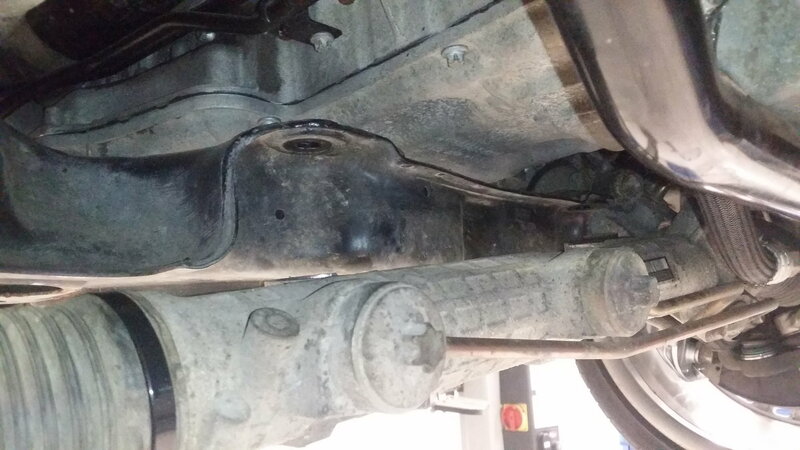 then check the rear suspension for play with a pry bar..
You won't feel play in the Sway Bar by checking the wheels. What works, however, is getting the car up on those plastic heavy duty ramps. Drive up on them so the front of the car is raised. Then get under the sway bar and grab it as if it were a barbell, and "bench press" it up and/or pull yourself up to it. 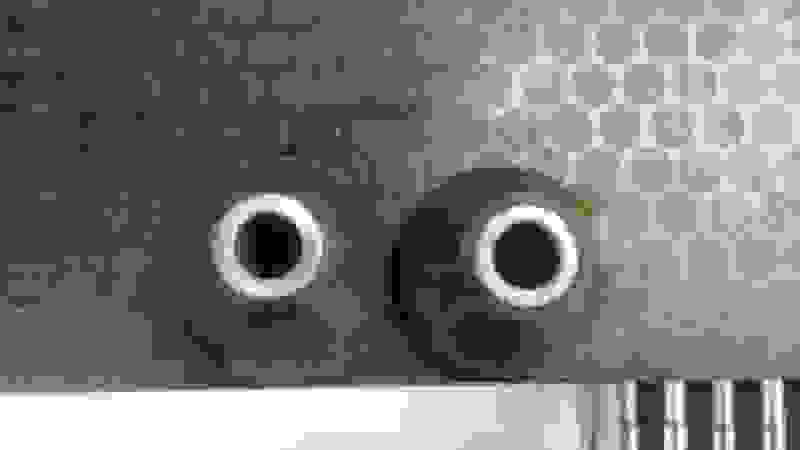 You'll be able to feel it "creak" if your bushings are sufficiently worn. Is it more the bushings the the sway bar end links? How was yours, worn out or still looked ok but changed anyway? Did not mean to post. Last edited by Rallyboy383; 05-12-2016 at 05:13 PM. Do you know where can i find it? My mechanic replaced the pedal and the problem is gone. But im not sure which no. code was throwing but he said it was pedal sensor. Got some brand new sway bar bushings. I'm going to take the advise of the guys here in this thread. Just need to find some time to put it on the lift. I hope it's that. You bought the sway bar bushings separate from the sway bar? I was under the impression it was only sold as one piece, because they were molded. Do you have a black and yellow license plate and turn left onto miramar from Eastgate to go home from work? I was too. but, I randomly found a pair of brand new bushings for sale on ebay. 1 pair left so I said what the heck. I'm going to see what the deal is. Nope, that's not me. No blk and yellow license plate. you guys have any update on this? Mean while i changed my steeringrack bushings too, just for fun. It was very easy and simple to do like allredy said here. Took some pics too. How did they end up working for you? Any more clicking? Not yet . Sorry I could not be more help to you. Have not been driving the AMG much lately. I have been gathering a bunch of parts I need to service the car. Now I could have a leaking rear air spring. Now a new height sensor or airmatic spring. So the list continues. I will update the thread when I get to it. Probably within the next few months. Last edited by Max.H; 08-10-2016 at 08:38 PM. I'm going to be dropping my steering rack within the next couple of weeks so this thread was absolutely priceless with the amount of knowledge i've gained from it. I have a very slight whistling, squeaking sound thats present when going about 25mph coming from the passenger front axle area. From the research i've been doing it looks like my steering rack is making the noise... but reading through this thread, somebody mentioned that ball joints can make squeaking noises. Any ideas? Id much rather spend the money on ball joints than on a freaking steering rack lol. 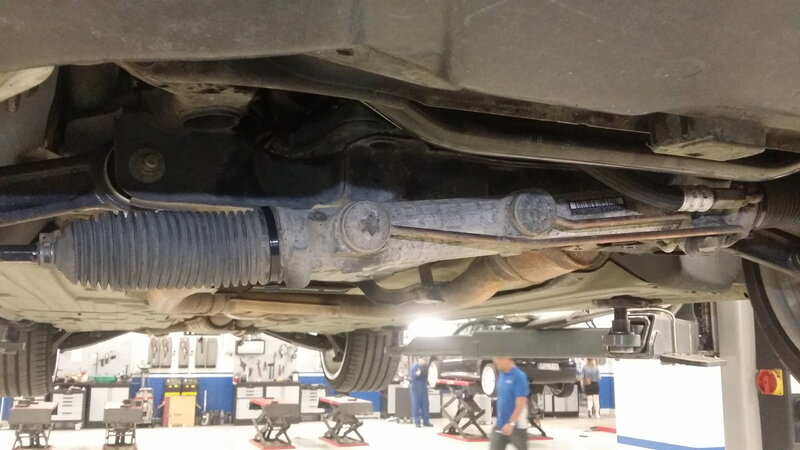 you may want to get the tie-rad ends (inner & outer) checked at a realignment shop. 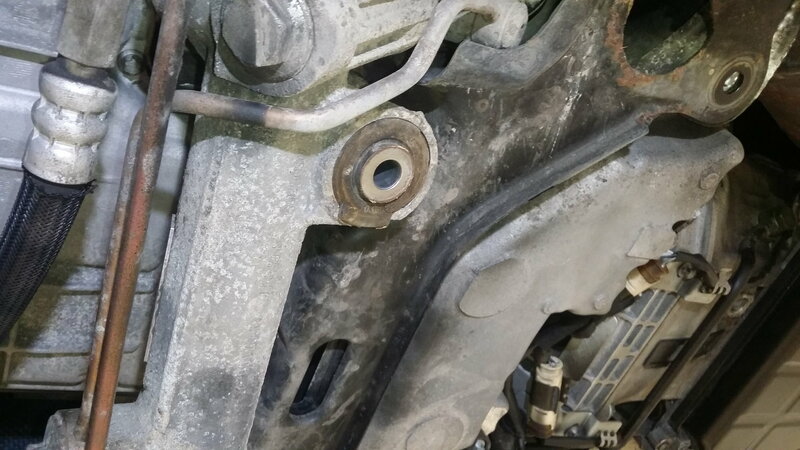 also check if your stabilizer bar link joint is loose/worn out and need replacement. The latter is an easy job that takes just 30 min. Last edited by BenZ190D; 08-10-2016 at 03:26 PM. Have a qualifield person check the front end. Sometimes the little squeaks can be HARD to find. My lower balljoints made a squeak when they went bad. First only while driving, even a slightest of a bump or roughness made them squeak and it got progressivly worse quickly. I have a "popping" or "creaking" noise I hear underneath after I have driven on the highway and am going at a lower speed. 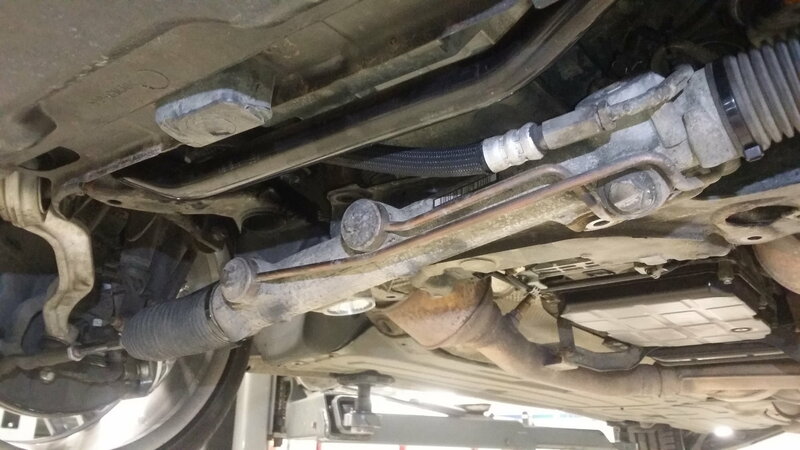 The dealership replaced the sway bar and links but that has not gotten rid of the noise. Has anyone else had this issue? Last edited by VinnyGirl; 08-22-2016 at 02:12 PM. Reason: I messed up! Could be the air struts making noise if there the originals. Last edited by dustinN; 08-29-2016 at 08:20 AM. 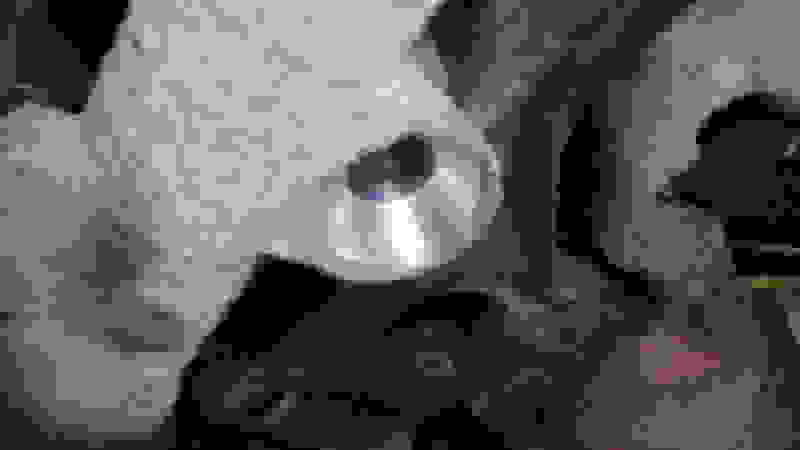 Quick Reply: Replaced all front bushings, still hear slight clicking noise going over speed bump.